Our Student Union building was packed this week with people pledging to never commit, excuse or remain silent about violence against women and children. The White Ribbon event included a panel of experts addressing how we can all make gender equality the social norm. As we learnt, inequality contributes to violence, and violence is a choice. We’re choosing to take a stand. Thanks to all who pledged, listened and took part. Jesse Lavery, pictured here with a white ribbon, was helping out as part of his placement with our Equity and Diversity team. This year Jesse will complete his Master of Social Work at La Trobe. 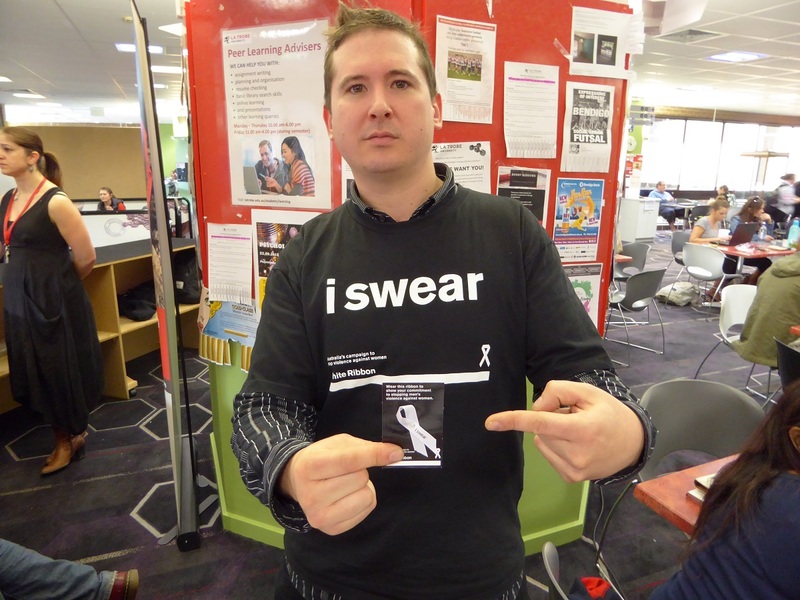 “I was part of White Ribbon Day in Castlemaine last year,” he says. “I’m also part of a group there called Men Can Bake Cakes. “Violence is a choice. We’re trying to get people away from that hedonistic masculinity that’s very ingrained. “We want men to choose to do nurturing things for their family and friends, like baking cakes. “Since I started my placement at the uni we’ve had Pride Day, RU OK Day and now a White Ribbon event. For me, this is something I’m pretty passionate about.